Even though he's an elite hunk, Sekine Keiichiro is a man who has lived his life out-of-focus, cursed by three handicaps: he's stoic, passive, and a Jack-of-all-trades but master of none. Id actually give this manga an 8.5 and seriously, where are all the reviews for this work of art? To be honest though, I, myself only found it when doing the 2017 manga challenge and one of the requirements was to read a hidden gem. This manga is definitely a well hidden gem. I love shoujo manga with male protagonist because they are just so rare and I did not think I would stumble upon more of its species. The story is pretty simple, the characters are older than high schoolers and in the work force, with Sekine being 30 and Sara,the woman, being who knows how old, possibly 23-25. Sekine is the male embodiment of the "cool perfection" archetype and Sara is the "happy go lucky". Sekine is a yes man doing whatever he is told because rejecting is too troublesome and most of the time just does not care doing extra work/being used. He lacks will, an ability to love, and hobbies and upon realizing that, on a whim decided to pick up a knitting hobby. He meets an old dude in a crafts shop and let the curtains rise on Sara, the shop owner whom he falls in love with. Spoiler not spoiler since there arent many other characters listed who could add to the romance genre this manga is listed as. So yeah, in short it is about an unhappy guy finding love. I really enjoyed Sekine's character, he is a fairly unique character and it was fun exploring the enigma of his mentality. He did not have the best experiences with women since young, seeming to have a few traumatic experiences which stems from his inability to refuse. It doesnt go into detail with them, showing only some memory fragments here and there but I would believe he doesnt think too fondly of them. He is actually quite emotional, being quick to tear up which is really cute. The art is hella nice btw. Sekine is finnneeee, especially young Sekine and non-megane Sekine. There are tons of knit items and strings in the manga which prob took a long time to draw. Props on that. I hate how underrated this is but at the same time, I like being one of the few that know of this gem. First and probably the last review so take my words with a grain of salt and beware of spoilers cause I don't know what i'm typing half the time. Also, to save any readers time, if ur looking for a drama, romance about a pure/ emotionless guy or if you're looking for a romance outside of all those Highschool lovefests, I recommend giving this manga a try. If you aren't, scurry off. I don't think the synopsis does a very good job of describing the manga though I doubt I could do better. 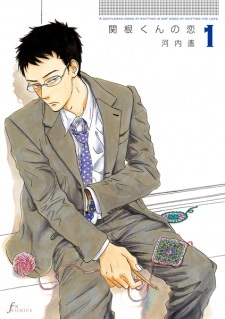 Essentially, Sekine-Kun no koi is about a man who seems perfect on the outside but is a mess within due to his past. we follow him as he falls in love for the first time but his pure character becomes an obstacle. don't want to spoil too much but the story really had me absorbed and empathizing with Sekine's character even though others may not like him as much. Not the best but not the worst. I believe the artwork really fits in when establishing the mood and characters. I would give it a higher rating but when viewed objectively, the art is lacking in comparison with other more mature themed titles. not many characters in this manga. If you like MCs that don't understand emotions/ themselves you'll love Sekine. in my opinion, the characters are well rounded, likable and most importantly, understandable..well to an extent. the "Sekine obsession" from the females around him is a bit absurd I have to admit. Though in all seriousness if you're not looking for a slowish paced drama romance from an eccentric dudes perspective I can't recommend. This review is heavily opinion based and my ratings are skewed due to my love of these kinds of manga. It was great as my rating states, it felt a little bit unreal (so 10 is out of question + other reasons). Sekine-kun no Koi is a story with a mixed josei and seinen vibe, meaning you have a girly romance with a mix of male perspective (dominated by male perspective). MC is an odd ball, he is basically an robo genius with no emotions of his, but as the manga goes so does story development. My last statement can be compared to a blooming flower (story starts slow then you see magic happen, feels train moving faster than light speed, also it is majestic like unicorn on sunny rainbowy day). Next will be why not 10, well it was unreal for me, why for me? I didn't meet a lot of genius ranked people (maybe), but his way of living seemed a bit too romanticized it was like here is MC he is demi god...So bow down to him (hyperbola of course but that how i saw it..at first). If you think that this manga is only about MC noooo you are wrong, it's simply that film started rolling with him, but in course of this story new people arrive and make this story RICH with different thoughts, feelings and experiences. I am biased against josei/shoujo art it is creepy as basement of drug dealer.....That being said character were great yet it had that girly vibe in there even like an faint echo, yet it still made a tiny bit creep out. Face expressions were good but body drawings well okishly great (still have that one drawing in my mind where MC's friends wife has alien like hands). Background was fine nothing great but nothing mediocre or bad. As for panel placement it was terrific (didn't have a problem finding the right panel) as for dialogue bubbles........also great (had you there for a micro second). Yeah a rare thing here character development, past somewhat deep events and growth. MC was weird or should i say quirky but in due time he changed from R2D2 to Don Juan (but more like a monogamous one, simply a magnet for females), before that he was also a Don Juan but it was a mystery for me as if girls are suddenly utterly retarded (since at the start he was shown to have only good looks, academic smarts and bravado of a buffoon (since he really didn't understand what he did). As the story goes you start to understand why he is a female magnet (if you think it was too short then deal with it, no spoilers). As for other heroes of this magnificent manga well they have their lives going for them, while MC is brooding or knitting people are actually go and do stuff (hard to believe that some mangakas remember this). MC Female is actually quite adorable in realistic way, she asks herself question that any person who meets opposite gender person who is amazing in almost every aspect. She felt real, some complexes some denseness at times but most of all she progressed (grew as a person). Main villain in this story is villain only first few chapters then you suddenly understand that, that so to speak "villain" out grew his villainous acts (i don't know from what point...a subtle spoiler). Speaking for characters they are alive, they have their own life going on and they don't stop or change abruptly due to story forced narrative. Supportive characters seem useless at some point but they actually support the story and are to be considered as people you meet for one day (i mean about real life), some change your life some simply are mobs (mobs to you not to everyone, remember this narcissistic p*&*). I enjoyed it, i almost didn't have any bumps (where i questioned something), beside the point that MC was questionable at first (but still too white princy for me). Also a quick heads up, there is NTR but in a mild form that it is faint and even pleasant (because it helps the story and is made not to frustrate you and your gray hair). This manga was like a pleasant breeze for me it did have moments where i was feeling insecure (about drama unfolding, usually i feel anger not insecurity where drama is concerned in manga). Would i advice someone? Yes but only to people who like romance in their manga also people who can't go with a little bit cheezy aspects for drama (Female wise). This manga is unique since it shows you people with their concerns and actual train of thought also like a told ya earlier it is a mix between josei and seinen (30-70% or 40-60%). Last but not least ENDING WAS A MAJESTIC, my inner girl screamed (I'm a male btw). The Main Story follows the plot of the man described in the Synopsis. This man seems to be good at everything...EVERYTHING! Though he doesn't know what to pursue. Thus you may start feeling that this man is horribly irritating, HOWEVER i beg you to just keep reading. You will in turn realize that this man has a flaw. The inability to get across what he thinks/loves/feels. Almost like what you would expect. Now i know that this is a everyday typical flaw in a perfect character, but it is a good flaw to have and one that allows for a proper story (character development) to be told. The Romance that i see here, is slow. Very slow. But the pacing for the story that is being told is just right. you wouldn't want it to increase. The art work, is pleasing enough to the eyes. You wont be irritated by it, but you wont be in awe either. Overall if you have time, and want to be told an intriguing tale, Have A Read. So far, I give it an 7/10.